I haves two clotheslines running parallel like a laundry yard between the old crabapple tree and a thatch of choke cherry completely buried in bittersweet. The seaward side of the crabapple arcs over the overturned Old Yellow Punt covered with a tarp. This makes a good work table where I lay out sponges and jars of dry dye powder, and mix dye solutions. I also have a bucket of wash water where I hastily rinse out my rubber gloved hands to minimize color corruptions, though often the ‘mistakes’ from color wandering off its intended spot has become a delight of discovery and the organic genius of the medium. I am outdoors. Usually there’s a lot of wind. As I work, I peg and re-peg the silk, taking the wet bottom edge to the top as soon as possible so it won’t blow up on a gust of breeze, cling to the middle of the fabric and leave a streak that, sadly, is rarely interesting since it is too weak to come to anything more than distraction. I have a second line up under the tree and out of reach for hanging pieces to dry or ones that need to drip before I can move on with them. It is also a good view spot since the main area is always so sunny it can be difficult to actually see the color work on the sheer silk. In the tree shade I can see what’s there. I hear the waves sluicing onto the rocky beach. Gulls and terns wheel overhead and from time to time, crows pass above in batches and settle nearby in the summer apple tree up that path which is full with fruit. Yellow attracts butterflies; they flutter around and land on the billowing silk. When the wind is high, the painting work moves quickly. I peg whipping silk to anything I can reach, usually bobbing tendrils of bittersweet that conveniently reach just about anywhere. The silk bellies and dries quickly. The outdoor studio strips away control and adds movement to the process. The silk is never still, which is right since it will rarely be still as it is dance with. Sometimes I peg the veil horizontally, sometimes vertically. 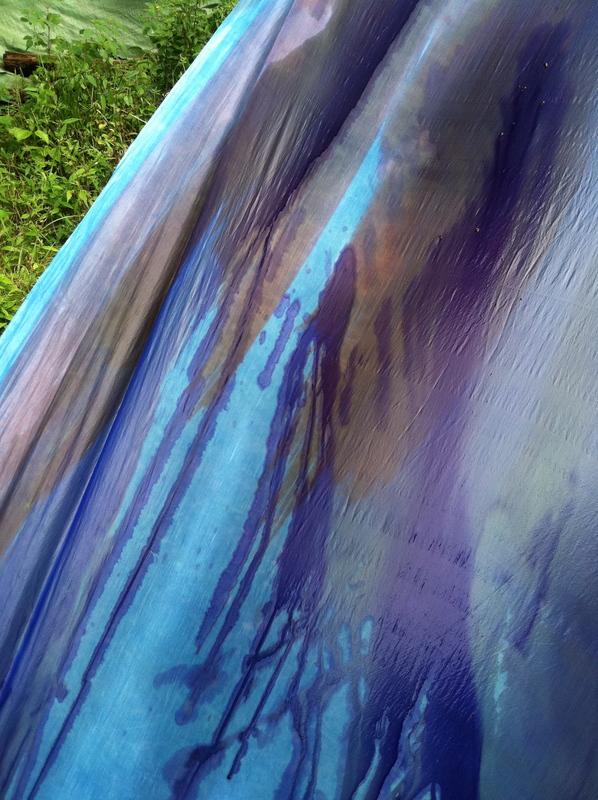 I pin it at the ground with stones o fold it under one foot as I toss dye onto the taut surface and let it run in rivulets down to where it puddles under my toes. I sometimes use the lip of the dye jar or the back of my fingers to spread the dye ro stop it. 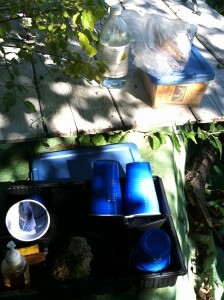 I use, sponges, spray bottles, sticks…anything that helps me discover what this veil wants to be. 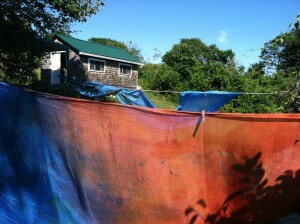 Once the silk is painted and dried, I rinse it in seawater I’ve carted up in buckets from the beach. Some days the churning bay water is full of bits of seaweed and sand that cling to the silk but will brush off as it dries. 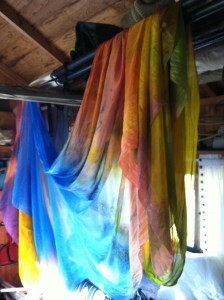 I hang the veils to dry again. I then bring them inside my cabin and hang them over the masts and booms and oars under the eaves where I can contemplate them, thinking about what next, if anything. Does a piece need more? What might that be? I drape them in different configuration to see how each one overlays itself since I except in most cases the veil will fall and fall again and again into heaps, rather than be stretched out like a canvas.